Module 1: Overview of Azure Storage In this module, you’ll learn about storage accounts – Standard and Premium – as well as storage endpoints and how to configure custom domain accounts. You’ll have an opportunity to practice creating and managing storage accounts. The module also covers data replication and provides a comparison of the different available replication schemes. You’ll be introduced to Azure Storage Explorer, a utility that lets you easily work with and manipulate Azure Storage data. Module 2: Storage Services In this module, you’ll learn about the disks component of Azure Storage as it relates to virtual machines. Disks are how virtual machines store their VHD files. You will learn about the types of disks and storage and how Azure simplifies IaaS disk management by creating and managing the storage accounts associated with the virtual machine disks. You will also learn about how Azure blob storage stores unstructured data in the cloud as objects, or blobs (BLOB = binary large object). And you’ll explore Azure Files, which offers fully managed file shares in the cloud that are accessible via the Server Message Block (SMB) protocol. The other file storage options covered in the module are Tables and Queues for structured storage. Module 3: Securing and Managing Storage In this module, discover how a shared access signature (SAS) can be used to provide delegated access to resources in storage accounts, allowing clients access to those resources with sharing the storage account keys. You’ll also learn how to use Azure backup as a cloud-based solution for an existing on-premises or off-site backup and data protection solution. This module also covers Azure File Sync as a way to centralize an organization’s file shares in Azure Files, and using Windows Server to cache the Azure file share locally, thus enabling scenarios such as “lift and shift,” backup and disaster recovery, and file archiving. Module 4: Storing and Accessing Data In this module, you’ll learn about using a content delivery network (CDN) to deliver cached content that is stored on a distributed network of edge servers closer to end-users. You’ll also learn how to transfer large amount of data to and from the cloud using the Azure Import/Export service. Module 5: Monitoring Storage In this module, you will learn techniques for monitoring the health of Azure storage. With metrics and alerts you can check a variety of performance metrics and send notifications to your system administrator team. With the Activity Log you can search and query for specific events, even across subscriptions. Module 2: Creating Virtual Machines In this module, you will learn how to create and configure Windows virtual machines. You will practice in the Azure portal, in Azure PowerShell, and with ARM templates. Module 3: Deploying Virtual Machine Images In this module, you will learn how to create custom virtual machines in Azure. For example, deploying a server image that is in your on-premises datacenter. You will also learn how to create and connect to Linux virtual machines. Module 4: Configuring Virtual Machines In this module, you will learn about the two main configuration areas for virtual machines: networking and storage. In the networking lesson, we will cover IP addressing, network interfaces, and network security groups. In the storage lesson, we will cover virtual machine disks, managed disks, attaching/detaching disks, and uploading disks. Module 5: Configuring Availability and Extensibility In this module, you will learn how to keep your virtual machines highly available with update and fault domains, and availability sets. You will also learn how to use scale sets to increase and decrease the number of the virtual machines as the workload changes. Lastly, virtual machines can be extended through custom scripts and Desired State Configuration. Module 6: Managing and Monitoring Virtual Machines In this module, you will learn the very important tasks of backing up your virtual machines and monitoring their overall health. You will practice backing up and restoring virtual machines. You will learn about monitoring, diagnostics, and Azure Advisor. 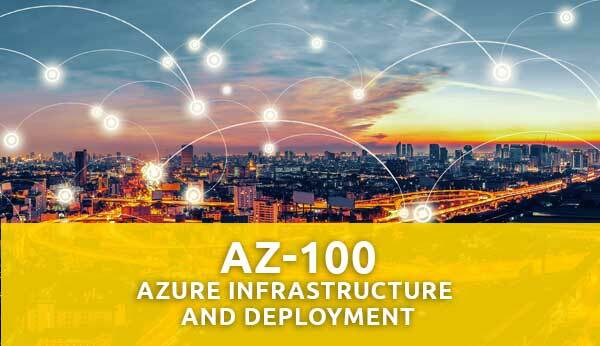 Module 1: Azure Virtual Networks In this module, you’ll will be introduced to Azure virtual networks. What are virtual networks and how are they organized? How do you create and configure virtual networks with templates, PowerShell, CLI, or the Azure portal? What is the difference between public, private, static, and dynamic IP addressing? How are system routes, routing tables, and routing algorithms used? Module 2: Azure DNS In this module, you will learn about DNS basics and specifically implementing Azure DNS. In the DNS Basics lesson you will review DNS domains, zones, record types, and resolution methods. In the Azure DNS lesson, we will cover delegation, metrics, alerts, and DNS hosting schemes. Module 3: Securing Virtual Network Resources In this module, you will learn primarily about Network Security Groups (NSGs) including NSG rules and NSG scenarios. You will also learn how to implement NSGs considering service endpoints, logging, troubleshooting, and other network traffic. Module 4: Connecting Virtual Networks In this module, you will learn about two specific types of intersite connectivity: VNet-to-VNet connections and VNet Peering. In both cases, you will learn when to choose which connectivity method, and how to implement and configure the method. Module 1: Managing Azure Active Directory In this module, you’ll will be introduced to Azure Active Directory. What is Azure Active Directory and how is it different from Active Directory Domain Services? What is Self-Service Password Reset and how is it configured? How can Azure AD Identity protection improve your security posture. How do you integrate SaaS applications with Azure AD? Module 2: Managing Azure Active Directory Objects In this module, you will learn the basics of implementing Azure AD objects. These objects include domains and tenants, users and groups, roles, and devices. In each lesson you will practice how to configure these objects through the portal and with Azure PowerShell. The Azure roles lesson will be your introduction to role-based access control. Module 3: Implementing and Managing Hybrid Identities In this module, you will learn how to integrate Active Directory with your existing infrastructure. You will learn about different authentication options like AD Connect, Single Sign On, and Pass-through authentication. You will also learn how to configure Azure AD Application Proxy and how it is used. "Very informative and kept things interesting. Great job on a wide variety of topics and an ever changing platform."